Bagni di Lucca Takes Flight! Bagni di Lucca’s Villa Gamba has already been the theme of one of my posts where I described the meeting between Giacomo Puccini and Baron Fassini Camossi. It was here that Puccini listened with fascination to certain Chinese melodies played on a carillon (or music box) belonging to his friend the Baron. Camossi had pursued a diplomatic career in China, was a veteran of the 1900 Boxer Rebellions there and probably acquired the box and other souvenirs in China at the notorious “loot auctions” that followed the Boxers’ suppression, when they met at the Baron’s summer house: that same secretive villa Gamba at Bagni di Lucca in 1920. Evidently Adami, the opera’s librettist, was also present. Tomorrow, Tuesday 25th April at 11 am, in the Sala Rosa of Bagni di Lucca’s Circolo dei Forestieri, Villa Gamba will feature again. This is because there will be a presentation of finalists for the Premio Corsena (prize) for 2017. It’s the first national literary competition on the theme of aeronautical history. What’s the Villa Gamba connection this time then? It’s because the full name of the villa is Gamba-Calderara and Mario Calderara (1879-1944), one of Italy’s greatest pioneer aviators, lived there. Calderara was the first Italian to get a pilot’s license in 1909 and was the builder of Italy’s first flying boat in 1911. He was the son of the Alpini regiment General Marco Calderara and Eleonora Tantini. Attracted to a life on the ocean wave Mario joined Livorno’s naval academy where he graduated as midshipman in 1901. He became fascinated by the problems of flight and studied avidly the pioneering efforts of Lilienthal and the Wright brothers and corresponded with them. Calderara began his first aeronautical experiments in 1907 and, on a biplane towed by a ship, managed to reach a height of over 50 feet, almost risking his life. Calderara got to know French inventor Voisin and worked with him on aeroplane design. In 1909 he managed his first unassisted heavier-than-air fight at Buc in France. The big breakthrough occurred when Calderara and Italy’s aero club invited Wilbur Wright to Rome. Wright gave Calderara some flying lessons and, consequently, Calderara’s flights increased in length. In 1911 Calderara built his flying boat, the largest in the world and managed to fly three passengers on it in 1912. In 1917 Calderara started a training school for pilots and became one of the founders of what would become the Italian equivalent of the RAF. There’s absolutely no doubt that Mario Calderara is yet another feather in the cap of those greats that have established Bagni di Lucca as a centre of past excellence. For example, our town was the first in Italy to have electric street lighting, the first one to found a Scout troop, the first to pioneer hydro-therapy, the birthplace of Puccini’s ‘Turandot’ (as well as the place where most of the maestro’s ‘Girl of the Golden West was composed. It’s great that Bagni di Lucca will now be remembered as the home of one of Italy’s greatest aviation pioneers and founder of its air force. The programme for tomorrow includes, besides presenting prizes to the finalists, the unveiling of a plaque to the memory of Mario Calderara at the villa Gamba with a visit to the villa itself (an occasion not to be missed! 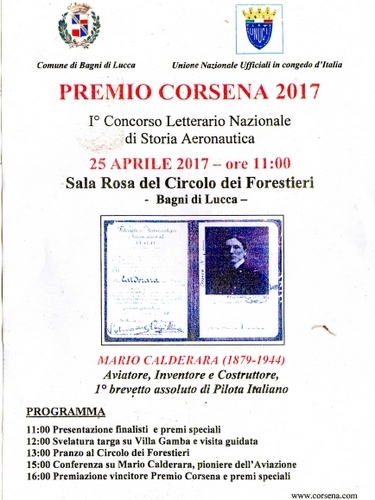 ), a lunch at the Circolo dei Forestieri and a conference on the great aviation pioneer who was Mario Calderara. Don’t forget to fly there! Waterfalls have, for me. always been a passion. The gushing of the water over precipitous rock slopes, the sheer energy produced by the flow, the often magical surroundings can truly be awe-inspiring. 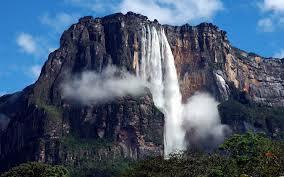 It would be great to visit some of the world’s highest falls; in particular to see Venezuela’s Angel Falls at 2648 feet in height and only discovered in 1933 . Perhaps one day I shall! In Great Britain traditionally the highest fall, at 371 feet, is Glomach in Ben Affric, Scotland. A considerable trek of over five miles through wild and lonely country is required to visit it but the moorland through which the path traverses is very beautiful. Although clearly paling in volume of water descending before such colossal as Niagara (which I saw during my trip to the States) Glomach’s great leap truly impresses. These photos date from our trek there in 1989. 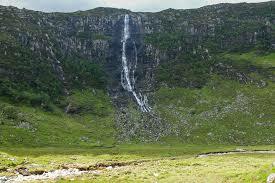 However, Glomach isn’t the highest waterfall in the UK. That privilege goes to Eas a’Chual Aluinn in Sutherland, Scotland with a drop of 658, feet making it three times higher than Niagara! Perhaps next time I’m in Scotland? My favourite waterfall is Pistyll Rhaedar in mid-Wales. At 240 feet it’s one of the UK’s highest single-drop waterfalls. A lovely path takes one up to its top and thence across into the heights of the Berwyn Mountains from which the waters draw their sustenance. These photos date from our first visit there in 1984. In our Val di Lima waterfalls can be highly seasonal; the highest volume of water falls from them at spring when the snows on the upper mountain slopes begins to melt and later in the summer many of them can completely disappear. Of our local falls, one of the most attractive is at Fabbriche di Casabasciana, near an otherwise unremarkable village on the way to Abetone. These falls can be approached by crossing an iron bridge which connects with a disused cartiera (paper mill). Even at this time of the year the falls are impressive. These photos date from May 2007. 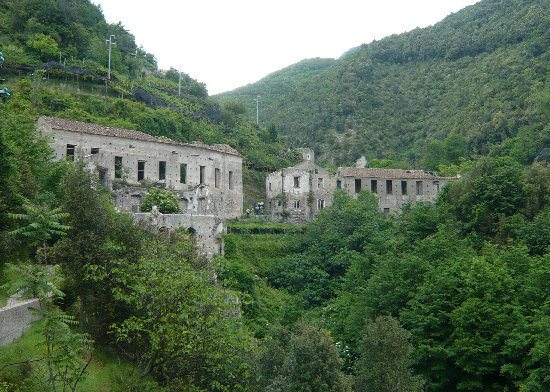 It would be good if a waterfall itinerary were issued by the comune di Bagni di Lucca. Especially in the hot summer waterfalls would be delightful places to visit in search of a cooler corner of the world! Italian architecture isn’t, of course, all about Renaissance palaces and Romanesque cathedrals. It’s also about industrial archaeology – buildings that once had a productive purpose but have now been left to decay. There are some fabulous areas equal to, if not surpassing, places like Ironbridge in the UK. Anyone who has done the route known as the “Via delle cartiere”, the road which leaves Collodi to climb to the pass which leads to Bagni di Lucca will know what I mean. Some of these old cartiere (or paper mills) have been adapted to the latest paper manufacturing techniques (much of the industry there is now concentrated either on recycling paper or manufacturing bog rolls) and others have been modified to provide residential accommodation. The fine brickwork and elegant arches of these buildings, designed more for industrial purposes than for beauty, create their own kind of beauty based on historic functionalism, years before Le Corbusier had anything to say on the matter. Several people have asked me what’s the colossal building they pass, if travelling by train, at S Pietro di Vico station. This building resembles a mammoth US mid-west granary and is so huge that it can be seen miles away. It’s on one’s left just past the EsseLunga roundabout if travelling to Lucca by car. It’s actually the tallest building in Lucca province, taller than the highest of its campanili and towers. For years I’d gone past this building without really knowing if it was in use or even what its purpose was. Recently, I decided I’d make a detour and take a good look at it. Here are some of the photos taken of it. The building if not beautiful is, at least, very imposing and almost ancient Egyptian in scale. But what was this building used for? I managed to find out the following from local inhabitants. It was a flour mill. The company of Fratelli Pardini started business at the start of the last century and flourished until the start of the 1990’s when it was bought up by the Cesillo group which, after the most incompetent financial management, declared bankruptcy in 1994. Since that year the building has been allowed to decay miserably and is now in an advanced state of abandonment. I tried to gain entry into the complex but would require strong wire cutters to do so and possibly a hard hat to protect myself against any falling concrete. The mill had its own branch line, to assist the distribution of supplies and manufactured goods. This can still be seen today forking out from the main track at S. Pietro a Vico which, incidentally, is the oldest station on the Lucca to Aulla line having been opened in 1892. (It took until 1956 to complete the line!). There have been plans to convert the mill into offices but these have come to nothing. One thing, however, is sure,: it would take a mammoth effort to demolish it and explosives aren’t an option given the proximity not only of the railway line but also residential property. Happily, Lucca’s ancient heritage is being more and more revalued today. It would, however, be a pity if its old industrial zones were to be totally ignored and neglected. I can think of yet another site near the mill, the Cucirini Cantoni textile mill, which has been abandoned. And yet these sites could be made into attractive tourist attractions rather like those in the north of England. A good sign is that already some abandoned mines in Sardinia have been reopened for tourism most successfully. Let’s hope that these wonderful relics from a more confident age will find new uses soon. To take just one example from the UK: that former cathedral of power, the Bankside generating station, is now the very popular venue for the Tate Modern in London.